In this article, we will learn how to perform a cross device analysis where you can better understand your users’ journey and make the most out of your campaigns. Also, we will explain why the data from Google Analytics and Facebook doesn’t match and the reasons why your Facebook campaigns numbers could be underestimated on Google Analytics. 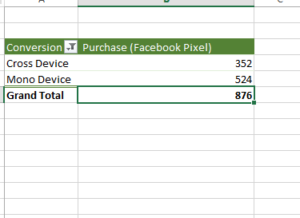 This shows you the breakdown of devices people used when they saw your ad. 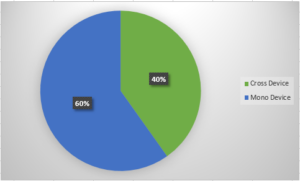 This shows the breakdown of devices people were using when they took any actions as a result of your ads, in other words where they converted. After you clean up and organize your data, you will have two columns, one for the impression device and another for the conversion device. The impression device column shows where people saw or clicked the ad and the conversion device column shows where people converted. For example, a user can click on your ad from an iPhone device and converts on Desktop Computer. In this case, you will see the impression device as iPhone and the conversion device as Desktop. 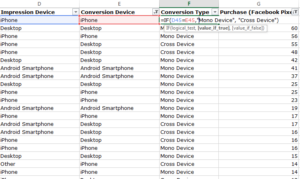 You can use the IF formula to tell excel if the impression device equals to the conversion device this means a “mono device” conversion, otherwise return “cross device”. 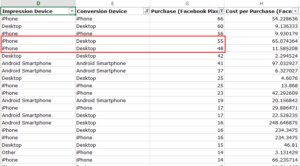 Looking at this specific example, you notice that 40% of our conversions that came from Facebook ads are cross-device conversions which are huge, but it makes sense as the majority of Facebook interaction happen on mobile devices. Imagine seeing an ad for a product on your mobile phone while in line at the bank. Do you immediately make a purchase on your phone? Probably not. But perhaps you go back to your office later that day and buy on your desktop computer. Such cross-device conversions are becoming increasingly common as people move between their phones, tablets, and desktop computers to interact with businesses. # Cross-device conversion which is difficult for Google analytics to track, even after implementing the User ID feature, it’s not as accurate as Facebook. # Different attribution models. 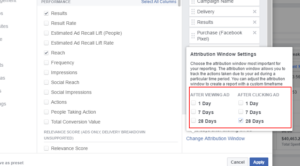 Facebook attributes a conversion to the last click happened on Facebook. On the other hand, Google Analytics attribution model is “last non direct”, regardless of the channel. One of Facebook’s biggest advantages over its competition is the ability to link actions to users instead of cookies, this means you can track and target the same user across all their browsers and devices as long as they are signed in to Facebook. To find the true value of your campaigns, you have to look beyond the last click attribution model on Google analytics in order to determine the most effective channel for your investment and evaluate the performance of a particular marketing strategy. The modern user journey is complex, understand the multichannel or multi-device journey is crucial to any business. You should be able to track the various touch points user take before and after reaching your website, in order to improve your ads targeting and hence your user experience. Facebook cross device report could be a powerful solution, however, technologies have evolved greatly, so you might consider investing in a cross device solution to measure the success of your paid social campaigns. Google article, but, how to determine whether I am to continue to invest on Facebook, crediting all those cross-device conversions that GA does not track, and believing that without a Face campaign those conversions wouldn´t come true?